Gather ‘round for a traffic-stopping outdoor living design in South Austin! Archadeck of Austin recently completed a project for these South Austin homeowners to improve the look and usability of their existing outdoor living space, which has garnered accolades from passers-by! You might find that having a unique outdoor living space in your back yard amasses popularity amongst your neighbors. First, who doesn’t want to live in a place, where neighbors have beautiful backyards? When your outdoor living space is even partially viewable from beyond, folks like seeing eye-catching designs, like this gorgeous cedar pergola. Everyone can appreciate that! — Inviting pergola design by Archadeck of Austin. Secondly, your neighbors are likely to want to “sample the goods.” Give them an invitation, hand them a cold beverage, show off your new space, and tell them Archadeck of Austin would love to design and build a custom outdoor living area for their home too! 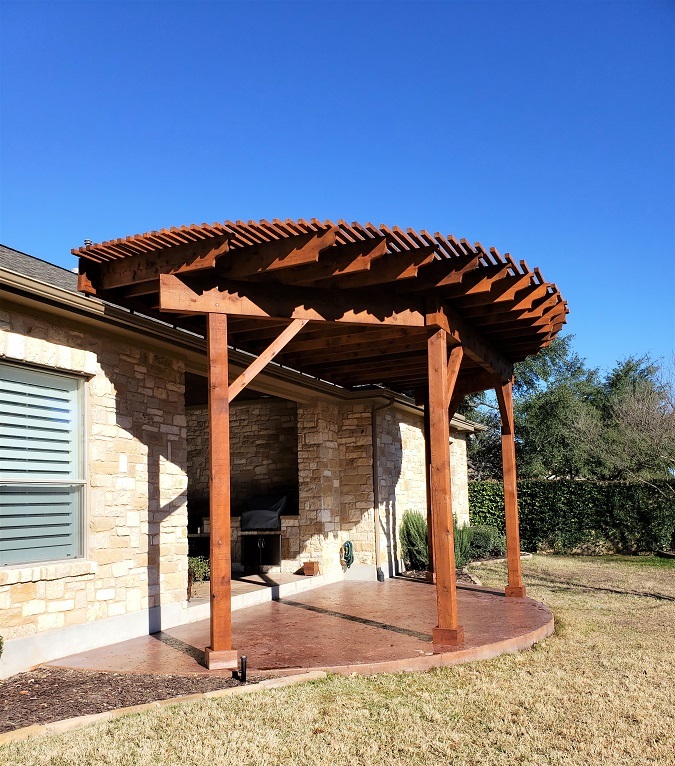 —Custom radius cedar pergola by Archadeck of Austin. This pergola was custom-designed to cover the homeowners’ existing semi-circle patio. We performed a “dry fit” with materials laying atop the patio to ensure that the end result was perfectly-sized and proportionate to the patio. 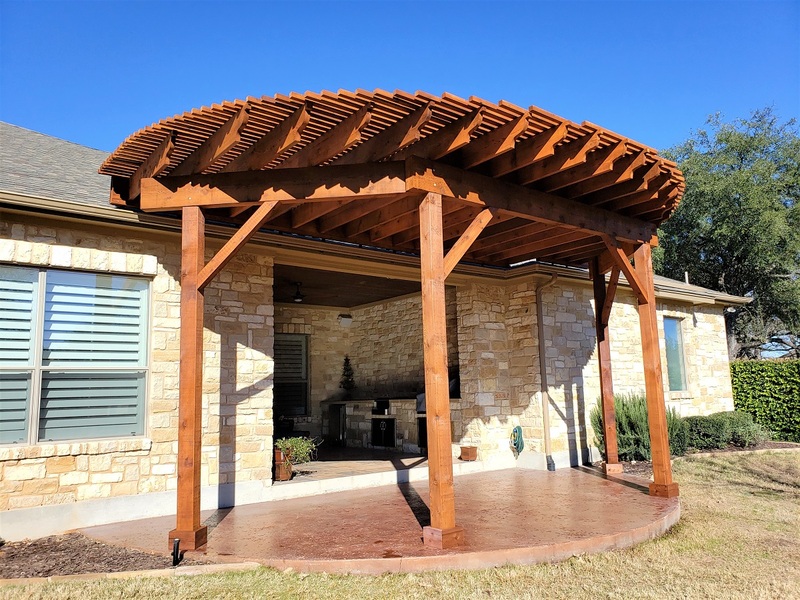 This South Austin family needed protection from the hot evening sun, so we topped the radius cedar pergola with tightly-fit wood slats for optimum sun protection. We attached the pergola with a bracket system, which will encourage rainwater to flow down the ledger into the gutters. The pergola was finished with rustic brown stain for a rich, saturated color aesthetic. Once completed, this family began to encounter a phenomenon of admirers stopping their cars to see the pergola, and asking, “ who built this?! ?” Aww, we’re blushing! 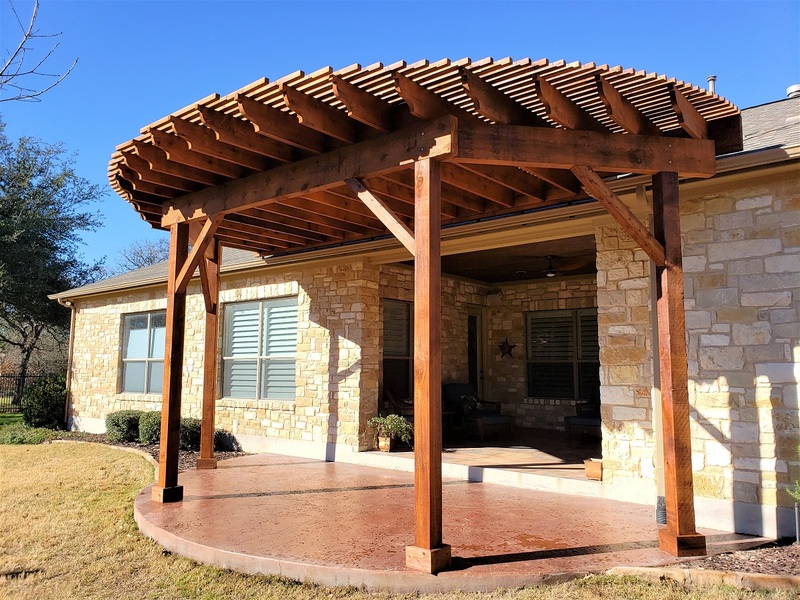 — Custom semi-circular pergola design by Archadeck of Austin. See another backyard makeover with a beautiful custom pergola design in Barton Creek West! The new pergola is the obvious show-stopper, or car-stopper as it were, but let’s take a look at this custom outdoor kitchen. Archadeck of Austin replaced a dated would-be kitchen, breathing new life into their space with more amenities than you can shake a stick at! We matched the home’s exterior stone, and gave them a new masonry built-in kitchen. 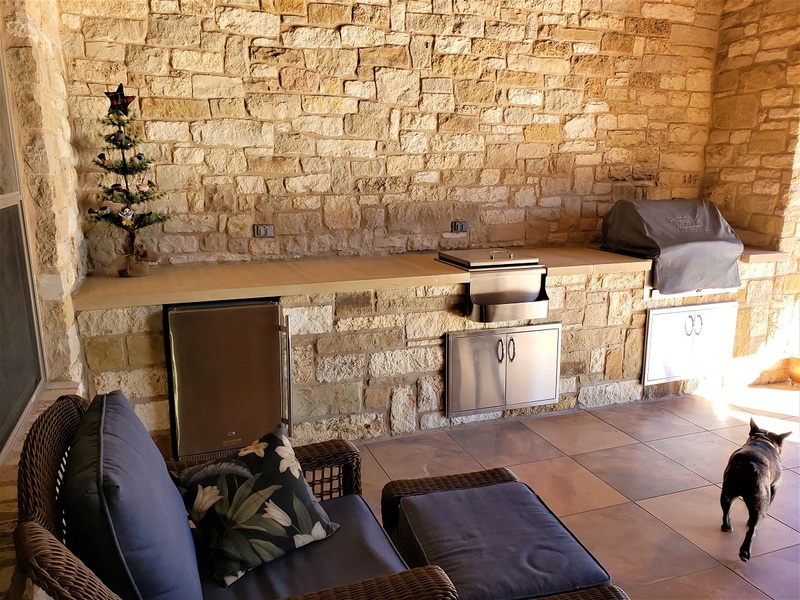 We upped the usability of the outdoor kitchen not only by giving them shade from the pergola, but also by providing an expanded Lueders stone work surface, refrigerator, storage, disposal, and even an ice bin with an adapter to hold bottles for extra cold beverages! — Beautiful outdoor kitchen design by Archadeck of Austin. 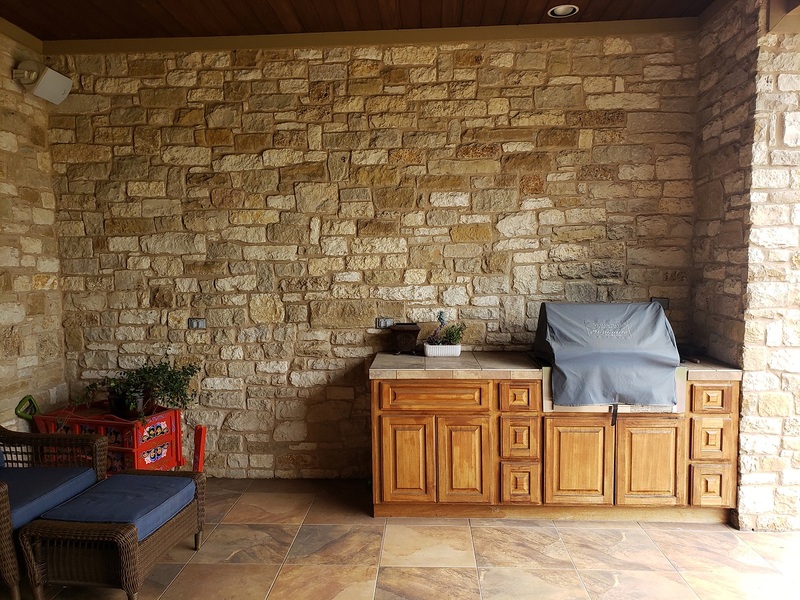 As you can see, these Austin homeowners had an existing outdoor kitchen area, which was in need of and update for aesthetics and usability. Allow Archadeck of Austin to turn your existing outdoor living space into something so much more! — The kitchen that came before was in need of so much more! 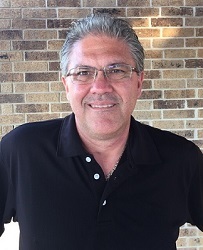 Archadeck of Austin will work with you to determine your specific needs for your new and improved outdoor space. If you have an area that is no longer living up to your needs, we can help! Don’t feel like you have to live with your unlivable outdoor living area – we can give you more. More amenities, more shade, more space, and more hours outdoors with those you love! Are you ready to improve your existing outdoor living area? Call Archadeck of Austin today at 512-259-8282 or email us to schedule your free design consultation.